The Hershey Chocolate Factory (the Hershey Chocolate Plant) had been in continuous operation for over 100 years. Now that most operations have been moved to other locations, the old Hershey Chocolate Plant had many of it's old areas torn down. Some of the other areas were remodeled into much-needed office space. I am very happy that some of the iconic architectural elements like the old smoke stacks still remain on-site. 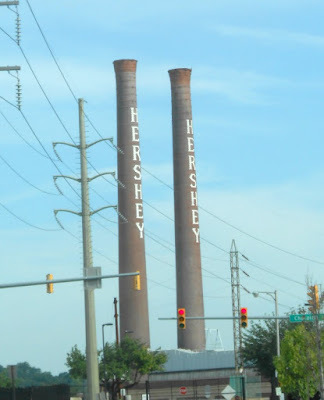 When you drive around downtown Hershey in Pennsylvania you can see the two famous smoke stacks from miles away. They have become a fixture within the Hershey landscape and tourists always stop by to take a few photographs of them. These particular icons are located at the east end on the old chocolate factory grounds. On the day that I took this particular photograph it was during the late afternoon hours and on a bright and sunny day. What I love about this particular angle is that you can also see one of the famous Hershey Kiss street lamp posts nearby. 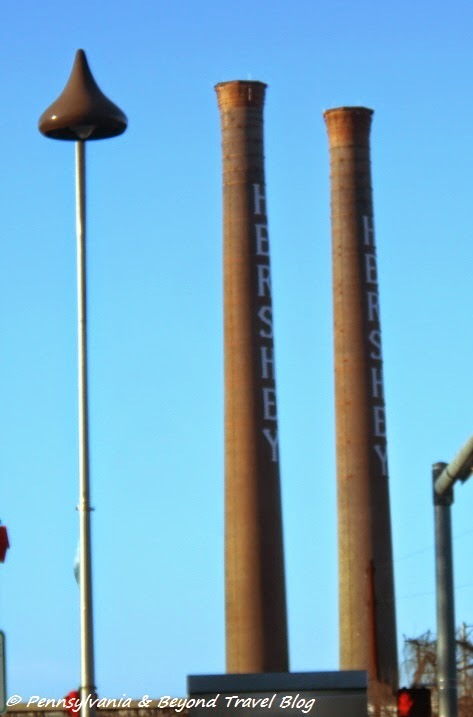 If you look close at the smoke stacks you will see the word "HERSHEY" printed in white on each one. If you are in town to visit the Hershey Theatre, the museum, the chocolate factory, ZooAmerica or even the Hersheypark amusement park, you will most likely see these iconic symbols while you are here. As you drive around, you'll get different views & angles of them, some better than others. I love this photo with the juxtaposition of the Hershey smoke stacks with the Herhey Kiss light pole.